Years ago, the inaugural post on this blog was about precisely this problem: should you follow common prescriptivist norms when editing, for a quiet life and to save your writers from the peevers? Or should you assist in the debunking of language myths by allowing new or common usages into print? I thought the decision was an uncomfortable one then and still do. But there’s no agonising about it here. Although there’s a certain amount of rhetorical loading – by “good English”, the writer means “formal English”, and “bad” means “informal” – this doesn’t seem to be an argument based on conservatism. Rather, it’s the raw pragmatism that’s so arresting. The argument is simple: “Some listeners are pedants. Some are not. Only pedants complain. So write for the pedants.” It even uses the word “appease”. 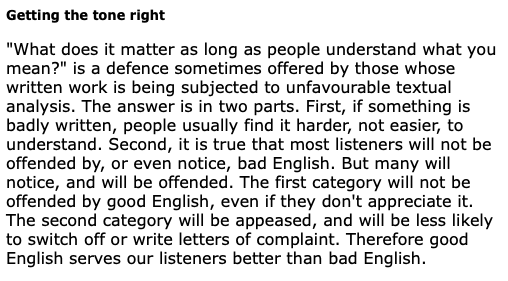 It should be said that this is from a guide to writing radio news that dates back to 2002. It’s still on the BBC website, but it’s not clear that it’s still the current advice. The BBC Academy, where many resources for the corporation’s journalists are now held, appears to have no equivalent passage on tone, and the latest style guide, although still prohibiting “enormity” meaning “size”, contains no observations about pedantry. But it wouldn’t surprise me if the BBC’s underlying approach to language was still just as cautious. For an organisation that gets trapped in the middle of every political and cultural row in Britain, it probably doesn’t take long to decide that there’s no point getting shouted at over “decimate” as well.